Danny Dorling has posted the audio of the talk he gave in Bristol recently on “Utopian tricks”, and it is worth a listen. It’s subtitled, “thinking ahead 100 years and back six generations,” and therefore links to a couple of my previous posts on here: on six (or seven) generations, and on looking forward a hundred years. His argument is that utopia is a journey, not a destination. We tend to look forward a hundred years, as Keynes did in his famous “grandchildren” essay, which looked out from 1931 to 2031 (a date which Keynes’ critics sometimes overlook). It’s a shorthand, as Dorling said, for “after I am dead”. When we go back, we tend not to go further back than six generations, or two hundred years. Which reminded me of one of Paul Saffo’s rules of forecasting: look twice as far backwards as you look forwards. These are tricks, but they are tricks about putting enough distance between the present and an imagined future to be able to reimagine the present. Dorling said he’s been writing some pieces for an anarchist magazine about those hundred year futures – on housing, schools, work and so on. His hundred-year future for housing was that a couple of teachers in Oxford might be able to afford a house in the city that was big enough to bring up a child in, though judging from the questons some of the audience missed his point here. There are geographical tricks to be had with time, as well, by looking at the places that are further ahead than we are, for example in Scandinavia. He used the example of immigration, where if you go back a hundred years, or so, to just before the Great War, the only passports were internal passports within Russia. Elsewhere there was free movement of people (it’s worth reading Joseph Conrad’s The Secret Agent to get a flavour of this). Of course, as demographics change, we need immigration more, as the UK has demonstrated recently. More broadly, Dorling observed, fertility levels in Europe are at 1.3 babies per couple. This isn’t just an ‘Old Europe’ phenomena; in places like Iraq and Turkey fertility levels are below those in the UK. In some big Asian cities, it’s now close to one. 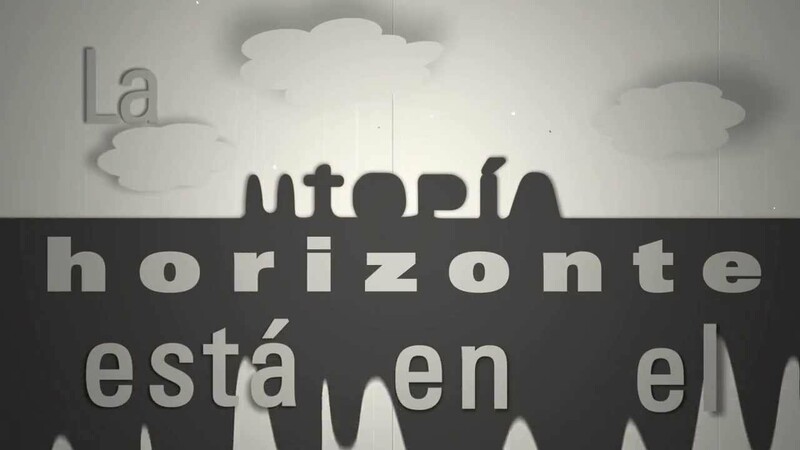 Image from Utopia: typography and animation by Santiago Ismach. So it’s possible to look forward a hundred years and see a world without borders, as countries with low fertility levels – well below replacement – invite in new workers to help their economies. And the purpose of such stories about the future – journey, not destination – is to get people to think and act differently now. And this linked to a couple of interesting ideas that emerged more fully during the Q&A. The first is the demographics of those last six generations. They are a time of consistent long run exponential population growth: from 1851-1971 the population increased each year by 2% per year. (In fact, as Hardin Tibbs later told me, annual population growth worldwide peaked at 3.1% in 1963.) And then in the late 1960s, couples started having fewer children, because of the revolution in the position of women in society. And looking back, it’s striking that Paul Ehrlich’s Population Bomb, now often derided, appeared just around the end of this long period of exponential growth. Dorling quoted Charles Darwin on algae blooms, and suggested that we’ve had a human algae bloom, but that it was now settling down again. And this was the second idea: that this period of population growth was a transition. The only other time in human history we’ve seen sustained population growth over six generations, he said, was duing the transition from hunter-gatherer to agrarian societies. We are, he said “living in a time of rupture”. On this reading, capitalism (I might say industrial capitalism) is a transitional phase, fuelled by population growth, between two different forms of social and human organisation, and it is coming to an end. Of course, others, such as Immanuel Wallerstein, have also argued this. If so, we need utopias more than ever. Danny Dorling’s talk was part of the “Utopias, Temporalities and Futures: Critical Considerations for Social Change Symposium” at Bristol University, from the AHRC ‘Connected Communities programme. So far, only the Call for Papers seems to have been put online, but I’ll update this if I see more information about the event. 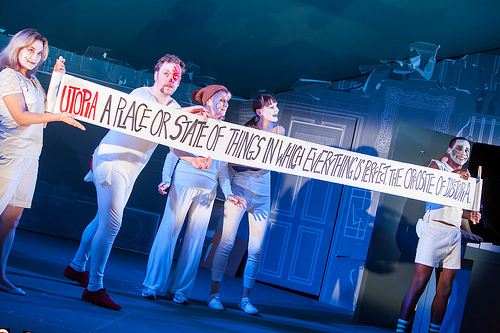 The image at the top of the post is from the Soho Theatre’s production of Utopia in 2012, and is used with thanks.